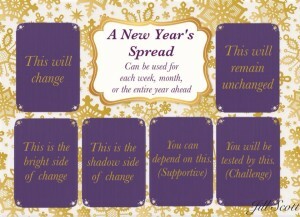 Everyone and I mean everyone, is going on about a New You for a New Year. There are some that are like: It was fabulous in 2015, why would I want to change that? And that’s great! But it wasn’t ace for everyone and everyone I know, has things they need to embrace, to change. We’re human, we all have to change, to improve. Otherwise, we end up bored, dysfunctional , aggressive, bored, angry, repressed. 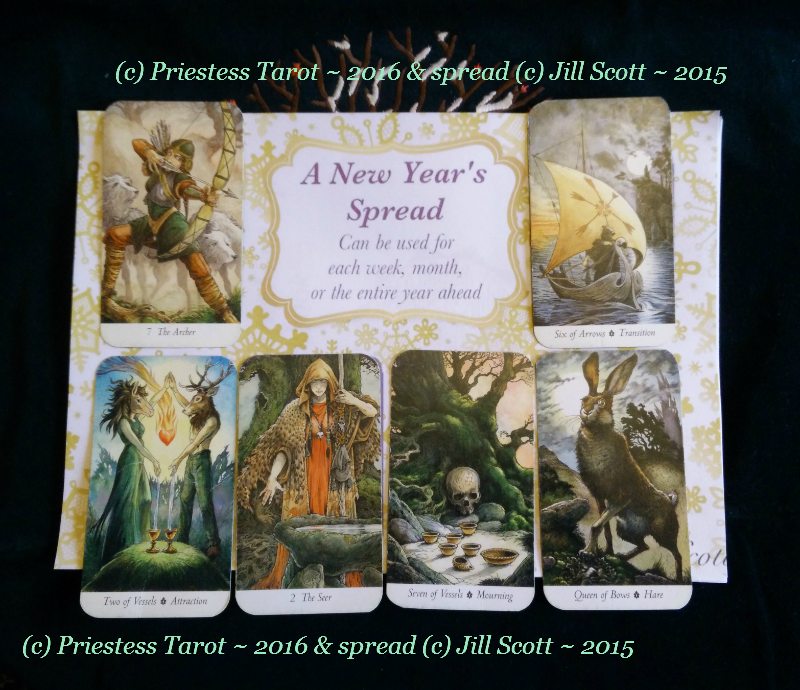 I’ve been trawling the various Tarot groups that I’m a member of on Facebook and the New Year spread I’ve chosen to do was designed by Jill Scott. 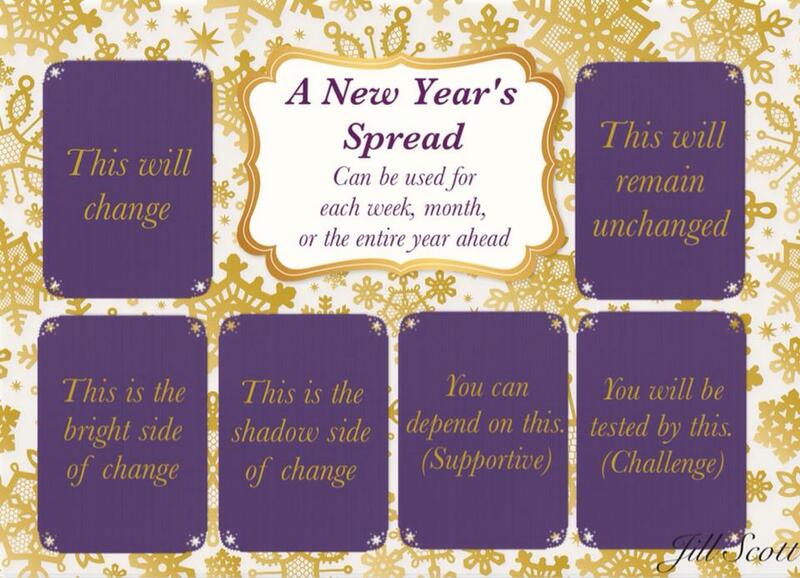 I chose to use it because I feel it’s the best overall spread, and as she says on the graphic spread she made, it can be used for each month as the months approach, or each week. It’s down to you! So, using The Wildwood (I’ll be adding another deck this year, keep your eyes out for it) I printed the spread out on A4 and put the cards upon it. I drew the top two first, then left to right on the bottom row. Here’s the raw spread I used that Jill designed. This is interesting, The Archer came up. I see this as my focus and direction will change. At the moment my ideas are a little.. stagnant? So letting things flow and come forth, is a good thing! Changing means you are, probably, alive. 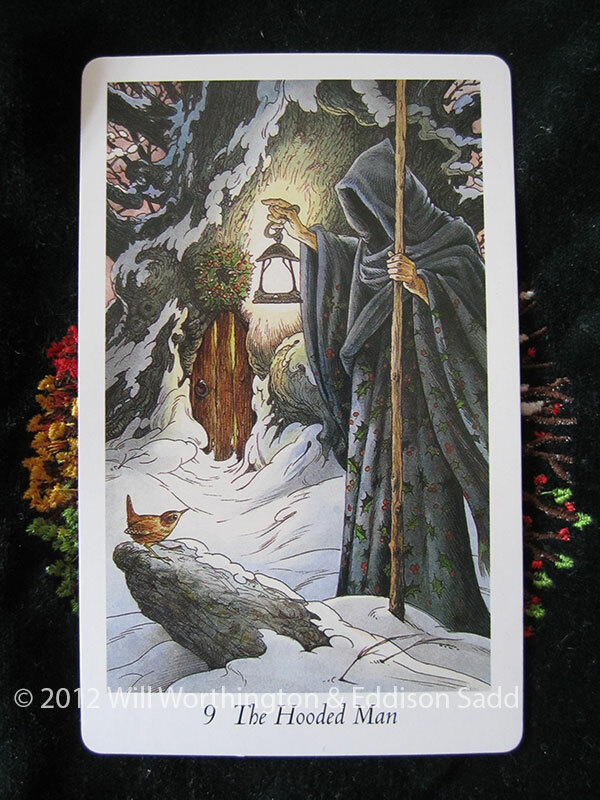 What do you see here for this card? Not one I wanted in this position, but that’s OK. Letting go of the past, transitioning away from what has gone before, can only be good thing. I get “trapped” into bad ways of thinking (as a lot of us do) and it takes time to change your mental habits. Hmm, the Shadow side has to be considered too, for without the darkness, we don’t appreciate the light. 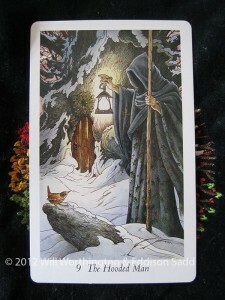 So, this year, as it’s a Hermit year, I need to perhaps consider things more than I have. Engage the brain and don’t forgo the creative side. Do you see anything else? This one has thrown me. The key word is mourning. Be at peace with the past? Why do I need to be at peace? What do I have to mourn? I don’t want to let important things go, but I realise things do end. This is another that has me wondering: What?! The Queen of Bows is a dedicated person who has great self-assurance (from the book) so am I to be tested by a Queen of Bows? Who might she be in my life? I don’t know anyone who is jealous of me! As a situation, it could be that her courteous understanding is testing me. She also represents the harbouring of slights or insults and undermining the plans of others. Ah, burnout is listed as a negative event, as well as being the victim of sorcery or petty spell craft. Lots to watch out for, I think! I’m looking forward to your thoughts on the questions I’ve put to you. I’d value your insight, to combine it with my own! 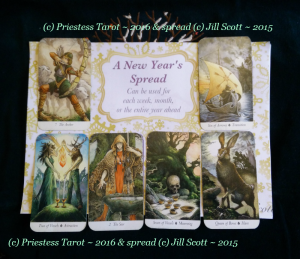 What cards did you draw for yourself, using this spread? Do share! Did you lay the spread: Top Left, Bottom Left….across to bottom Right, Top Right; or, Top Left, Top Right and then bottom row L to R? Top left, top right, then left to right on the bottom row.